With Nintendo’s motion controllers now into their second decade of life, I find myself… agnostic. I like Wii Sports and I think pointer aiming in Twilight Princess was awesome, but I don’t like gyro aiming in Splatoon and the less said about Star Fox Zero the better. So where does Arms fit in? Due June 16 for Switch, Nintendo’s one-on-one cartoon brawler can be played either with Joy-Con motion controls or with standard controllers. But at a preview event held earlier this month, Nintendo only let everyone play with motion. I can’t tell you what I prefer without trying both, but I can say that motion doesn’t feel bad, so far. In fact, thinking back, what I liked about it was that it didn’t really feel like “motion control” at all. You hold the two halves of the Joy-Con upright and vertically, tilting them in tandem left, right, forward or back to move your character. It’s essentially like playing a twin-stick arcade game, like Virtua On or something, only the “joysticks” in this case are unmoored from any base. To punch, you don’t have to take a big ol’ swing with your arms or anything—just lightly and quickly flick the Joy-Con forward, and you’re golden. Once your extendable robot arm is flying through the air, you can put some English on it by tilting the controller in the direction you want your fist to fly. Flicking both controllers at once will attempt a grab-and-throw. And that’s about it for motion controls. ...Oh, well, I guess there’s a little bit of waggle-and-flailing whenever you fill up your super meter, because then you have to punch rapidly and without any sort of precision to beat on your opponent. But that’s maybe five seconds out of every match. In the many matches I played against various and sundry reporters and YouTubers during the preview event, it started to become clear that the path to victory was less about mastering the controls and more about reading one’s opponent. Were they throwing a lot of punches willy-nilly? Probably a great time to jump and air-dodge out of the way and catch them off guard. Were they slow and methodical? Maybe going on extreme offense might work, or else bait them into moving. Since every one of the game’s characters has the same basic control scheme, you can flit between them fairly easily to find out who’s right for you. While Nintendo introduced new characters to the game in this build including the sure-to-be-fan-favorite Twintelle who fights with her hair, I just stuck with reliable old Ribbon Girl because she can double- and triple-jump. Good enough reason. 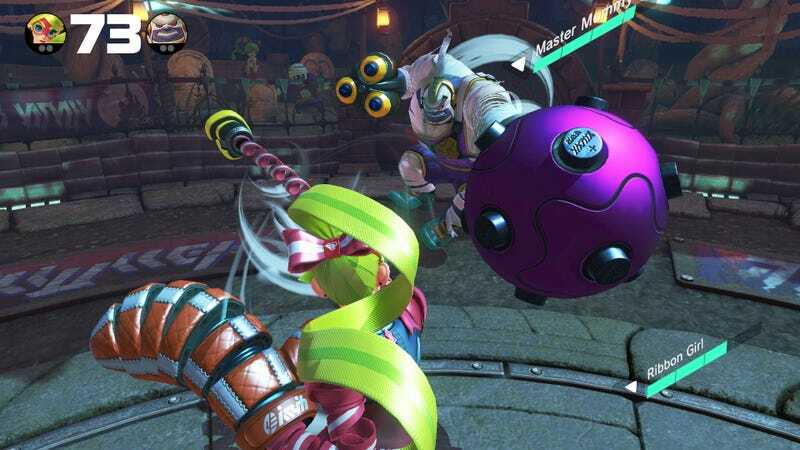 As an over-the-shoulder, one-on-one fighting game with free 3-D movement and motion controls, Arms is asking you to do a lot of things that few if any other videogames have in the past. To that end, the game’s numerous bonus modes all seem geared around teaching you specific skills. “Hoops” takes place on a basketball court, and you must grab and throw your opponent to put them through the giant basketball hoop and score points. And “Skillshot” tasks you with punching a series of targets, so you can learn how to curve and aim your fists precisely where you want them to land. While I still don’t know even the basics of how Arms will control without motion, I did find out from Nintendo that you will be able to play it with a single Joy-Con held horizontally. This will probably be the least comfortable way to play it, but considering that the game has a two-versus-two team battle mode, you may have to deal with it unless you want to spend a few hundred dollars on more controllers. In this mode, players on each team are tethered together, which doesn’t restrict your movement around the arena, but does make you work together as a team—if your opponent gets thrown, so do you, so you are incentivized to keep them safe.